← Second excerpt from my next book! Welcome to the third excerpt from my Pride & Prejudice alternate history! My plan is to post the first quarter of the book in weekly segments. That’ll take you through the point which will answer some of your biggest questions. If you missed the first two chapters, here they are: Chapter 1 and Chapter 2. Elizabeth continued to limp for the remainder of the evening, but in the morning she declared her ankle much improved. Otherwise her imaginary injury might interfere with her visits with Jane, and she did not want that. Fortunately she was still in the house when Mr. Bingley called to inquire after her recovery. It was a remarkable civility on his part, given that he knew she had not been injured at all, but Elizabeth was not inclined to complain. Mrs. Bennet could not contain her excitement at this apparent sign of interest in her least favorite daughter, so after the briefest possible conversation, she suggested that Elizabeth should show Mr. Bingley the gardens. He accepted with alacrity. Once outside, Elizabeth said, “I apologize for my mother’s assumptions. Pray be assured I have no expectations of you or anyone else.” Would he realize she was referring to Mr. Darcy? “Do not mention that! It is beyond embarrassing.” cried Elizabeth. When they reached the empty stables, Elizabeth told Bingley to wait at a distance before she knocked three times at the door. Jane opened the door with a smile. “Good morning, Lizzy!” She stepped back to allow her sister to enter. Jane stiffened. “Is she someone you trust? Should I prepare?” She ran her fingertips down her cheek to indicate putting on makeup. Elizabeth signaled to Mr. Bingley. He came forward with his customary amiable smile, but then his face took on a stunned expression which gave Elizabeth great satisfaction. Jane’s hair had grown back enough to frame her face with golden curls. It suited her, and in a few months it would be long enough to pass for one of the fashionable cuts popular in London. And nothing could disguise the beauty of her face and form. “And I am glad you did!” declared Mr. Bingley. “I will speak to Darcy about it. If he does not object, I would be happy to introduce them.” Mr. Bingley beamed at the thought. Elizabeth suspected Mr. Bingley would seize any excuse to come back to see her sister. Darcy knew he was going to regret this. He had brought it on himself with his actions at the assembly, and now he had to follow through with the appearance of interest in Miss Elizabeth Bennet. Even if Bingley had not been so insistent about taking Georgiana to meet his new angel, Darcy would have had to make this journey to Longbourn. But he could have traveled alone then, and that was half the problem. Elizabeth Bennet disturbed his peace of mind, yet he found himself craving her presence. He could not afford this sort of emotional turmoil. And he wanted to be alone with Elizabeth, not observed by Georgiana. He had dreamed of her last night, of his Titania in the bluebell wood, but in his dream she had no pistol. Instead she held her hand out to him, beckoning him with that impish smile of hers. And he was all too ready to be beckoned. Best not to think of the rest of that dream, though, not when he was about to be face-to-face with her. If Elizabeth ever discovered the content of that dream, she would slap his face and refuse ever to see him again. But even then, he would not go, because she was his Titania. Good God, now he was confusing dreams with reality! Georgiana was watching him already, her finely arched brows drawn together in puzzlement as she twisted a ringlet around her finger. It was no wonder; he was not behaving like himself. “Let us see how it goes.” The rational part of his mind – the small, overwhelmed rational part – considered the visit a good idea. Georgiana had been chafing at the bit this last year, longing for the company of other young people and frustrated by her isolation. An overly serious and solicitous elder brother who watched her every move was not the sort of companion any young girl would wish for. But what else could he do? He had to keep her safe. Perhaps an acquaintance with the two eldest Bennet sisters was what she needed. What he needed did not matter. He had given up the right to consider his own needs. After the carriage drew to a stop, a footman opened the door and flipped down the steps. Georgiana carefully rearranged her expression into her well-practiced one of placid, bovine stupidity. It was wrong that a fifteen-year-old girl should have to learn so well how to wear a mask. But there was so little right in their world. Why should one more wrong matter? When he tried to remember his own carefree days before his father left, it was as if they had happened to someone else, a long, long time ago. “I prefer the fresh air.” It was impolite but he did not care. He could not leave Georgiana alone in a place where she knew no one. The sun seemed to shine more brightly when Miss Bennet appeared wearing a bonnet and spencer. Good; she must be planning to join them. But he must remember to call her Miss Elizabeth, not Miss Bennet, since her elder sister was the true Miss Bennet. Miss Elizabeth. He liked the sound of it. And he liked seeing her altogether too much. He must not let anyone guess how much her mere presence lightened his heart. “Good morning, Mr. Darcy.” Her smile was cautious. Had he not made it clear to her that Bingley had already told Miss Elizabeth the truth? Then he looked back over his shoulder. The manservant stood in the doorway watching them. Georgiana was simply being careful, just as he had taught her. “I would be very glad to do so. I am indeed a great walker when I have the opportunity, which is not as often as I would like.” An odd wistfulness within her voice. “We hope to meet her, but she is far from the only attraction here.” Despite Bingley’s praise of the mysterious sister’s beauty, Darcy could not help thinking he would prefer his own Titania. “Truly? How interesting. What say you, Mr. Darcy?” The teasing glint in her eyes was a challenge. He followed her past a series of empty stalls. Had they built a new stable or were all their horses taken by the French? Most likely the latter. A golden haired woman opened the door that Miss Elizabeth knocked at. For once Bingley had been correct about Miss Bennet’s beauty, although Darcy preferred more liveliness in a woman’s expression. He fought the urge to rest his eyes on Miss Elizabeth. He should be focusing his attention on Georgiana. As Elizabeth made the introductions, his sister seemed to manage well in the conversation despite her limited experience with strangers. Until the last year or so, she could not be trusted not to blurt out something inappropriate or dangerous. Miss Bennet seemed a safe sort of acquaintance, especially as she was not in a position to spread gossip. She was almost maternal in her behavior towards Georgiana, gently drawing the girl out. If Georgiana liked her, this could indeed be a step forward. After a short time, Elizabeth said, “Mr. Darcy, you are very quiet. I hope we are not boring you.” It was a challenge, no doubt about it. Georgiana bit her lip, a stricken look in her eyes. No doubt she was worrying as she always did that someone would be angry at her for any slight mistake. 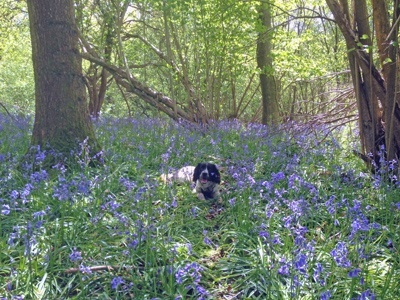 Elizabeth stroked Rose’s furry head as the bluebells danced around them. “You have been doing an excellent job,” she told the dog. “Yes, and now the family she left behind no longer exists. Her grandfather, King George, is a madman imprisoned in France, ruling in name only. The princess would have been executed like her father, the Prince Regent, had she remained here. But she still has lost her place in the succession, with Napoleon’s brother declared heir to the throne in her place and married to King George’s youngest daughter as a sop to English pride.” Darcy’s upper lip curled. “But there is no English law now, only a scared little girl half a world away, with the entire country waiting for her to save them when neither the king nor the military and naval might of England could do so. Perhaps they think she will bring the French to their knees by throwing her dolls at them.” Bitterness edged his words. “You may be certain I will say nothing, but I am sorry for your loss.” She understood his desire for secrecy. If his father’s actions were known to the French, both Darcy and his sister would have been in grave danger. Others had been guillotined for less. Still, it was baffling. His father had been loyal enough to go into exile rather than live under French rule, but his son had become a turncoat. It did not make sense. “It is better if everyone believes he died long ago. It is simpler that way.” He wrestled the stick away from Puck, who immediately sent up loud yapping. It was just a fact of life. So why did it make him frown so ferociously? Darcy minded his tongue as he and Elizabeth returned to the stable. He had told her too much, and it had to stop. No matter how well-meaning Elizabeth might be, she was not in the habit of disguising her feelings or considering what she said before it left her mouth. But she was far too easy to confide in. When had he started thinking of her as Elizabeth? It was hard to see anything at first when they entered the dim stables from the bright sunshine. Elizabeth halted beside him with a sharp indrawn breath. Her shoulders lost some of their stiffness. “I see.” But her voice still trembled. She had been well and truly frightened. A rush of anger filled him. She should not have to worry so much. Bingley, of course, was in Miss Bennet’s tiny sitting room and looking as enamored as Darcy had ever seen him. Georgiana appeared to be at ease. A good sign. Was she displeased to find Bingley there? He could think of no other reason why she would try to leave the moment she had arrived. Then he noticed there were only three chairs available in the room. Perhaps she was being tactful. “Might I accompany you?” asked Darcy. She paused in the process of leaving. “If you wish.” But she sounded puzzled. “Yes, I wish,” he said firmly. “You forget I will be calling on you in any case to keep up appearances.” He tried to say it lightly. She frowned and said nothing, but perhaps that was because they had reached the kitchen door of Longbourn. When she reemerged with the tea tray, he took it from her. Watching her do a servant’s work was intolerable. “I thought you would like him.” Elizabeth tried not to sound smug. “After only two meetings?” Elizabeth teased. So, the plot thickens, we have met Georgiana and Jane, and Darcy is finding it too easy to confide in Elizabeth. I’d love to hear your thoughts! Now all I need is a title – any ideas? I have a couple of possibilities, but none are just right. In the meantime, come back next week for the fourth part of the story! I really did not think I would like this concept but after reading the first 3 chapters these incarnations of ODC keep rattling around in my head and I want to know more. I’m intrigued as to where the journey will take us this time.